I'm glad to see that baby is already wearing stripes! yes, love the spripy shirt! Good to see the photographer to. i forgot to mention last night how much i loved that shirt. it's great. and so are you! in it or out of it... uh... in a friendly sort of way... like in another shirt... you know. You looks so good and I love the picture. We've barely done any belly shots either! You've inspired me to try to remember to take one on Sunday--30 weeks for me. Gulp. I *love* this portrait! 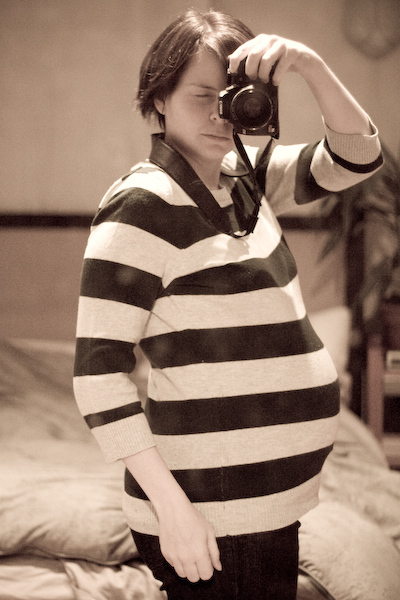 And your blog really makes me wish we had digital cameras and blogs back in my pregnancy/baby days.